This morning Premier Ford and Minister of Transportation Jeff Yurek announced a $28.5 billion plan to expand the Toronto transit network, including a Relief “Ontario Line” from the Eglinton Crosstown into the downtown core and onward to Ontario Place. Other projects proposed include more stations on the Line 2 East Extension fully funded by the government, and the Eglinton Crosstown connection to Pearson airport. CodeRedTO welcomes the announcement of provincial capital investment in the expansion of Toronto’s transit network, and especially the longer Relief Line which provides a higher return on investment and higher level of Line 1 relief. Provincial investment is a necessary part of the City of Toronto being able to engage in recent transit funding offered through the federal government, and it is good to see both the federal and the provincial governments making such significant contributions to transit. Improved and expanded transit is necessary for economic growth in the entire Toronto region, whose success is both a provincial and national economic engine. While the current TTC Relief Line plan could begin construction in 2020 with confirmed funding, modifications to technology and alignment inevitably create some delay. The addition of a new technology mode to Toronto’s rapid transit network could bring potential benefits in the form of procurement or construction speed, or reduced day to day operations cost. But it also brings risks in the “learning curve” without any existing network off of which to build, and increased costs for duplication of maintenance facilities and spare vehicles. It will be vital to manage these risks to bring the best overall result within the remaining time before Line 1 crowding becomes dangerous. It is also important to note that all “megaprojects” experience delays and cost increases, some required and some political. In fact, nine out of ten billion-dollar-plus projects go over budget. The research clearly shows that the most important elements of megaproject management are in the planning: evidence-based, transparent process, and a rigorous business case. Missing from this proposal is the high-priority Waterfront East LRT, which will serve to enable access and transit-oriented development already in progress. Both the City and Province must align on this project rapidly to ensure travel patterns are built appropriately. We also have concerns about the process to date. As we move forward, we hope the province will engage the city in an appropriate partnership and align on the planning of transit, particularly before making public announcements that have a material impact on existing city plans and spending. We also hope that partnership results in a provincial commitment to improving the funding of the operations and maintenance of the existing transit system in Toronto. The TTC remains the least subsidized transit agency in Canada and the United States, and it is currently not able to provide a level of service appropriate to its ridership. According to the American Public Transit Association’s report Open for Business: The Business Case for Investment in Public Transportation, “every dollar spent on public transportation generates $4 in economic returns.” We note that the City has to finance its own share of these capital expansion projects, in addition to the federal and provincial contributions. We hope to see the City revisit its budget and make a serious plan to find the necessary capital for the most worthwhile investments. CodeRedTO supports better transit options for more residents across the city and region, using all the tools available to improve economic and personal mobility. This includes mass transit expansion, better performance for existing transit, integrated active transportation infrastructure, and dedicated reliable funding to support community and business transportation needs. The King Street Pilot program took Toronto’s busiest surface transit route, and converted it from an unreliable, slow, mockery of transit into a rapid, dependable artery which is 81% more reliable for business and community members. Tens of thousands more transit riders began using King Street, and now over 80% of people traveling King Street in the core use transit as part of their journey. Now that the King streetcar is significantly more reliable and consistent for riders, more hop-on and hop-off decisions can be made to visit local retailers, even during short timeframes like a short employee lunch break. In fact, 76% of King Street users in a survey indicated they’ve visited local retailers just as much or even more since the pilot began. While personal cars on and near King Street are a minority of road users, the side-effects of transit network development are important to monitor. City Staff measured personal car travel times in nine locations nearly twice daily across two months, and in only one location did travel times increase more than 90 seconds on average, on Dundas. In three of nine locations car traffic was more than 30 seconds faster! When we consider the increased transit ridership, the increased transit reliability, the limited impact to other road users, the reduced carbon emissions, the improved active transportation potential, and the extremely low capital expenditure, it is clear that the King Street Pilot is a model for transit improvement and should be made permanent immediately. There is insufficient justification to reverse or limit any of the modifications made in the pilot, and CodeRedTO strongly urges City Council to maintain enforcement and to make King Street our permanent model for future transit corridor prioritization. Posted in information | Comments Off on A few more thoughts…. Toronto has an overly-simple rail network and the lowest overall subsidy (30.4%) in North America, and has no dedicated revenue sources, unlike most peer transit systems both older and younger, which leave our network uniquely vulnerable to political obstruction. 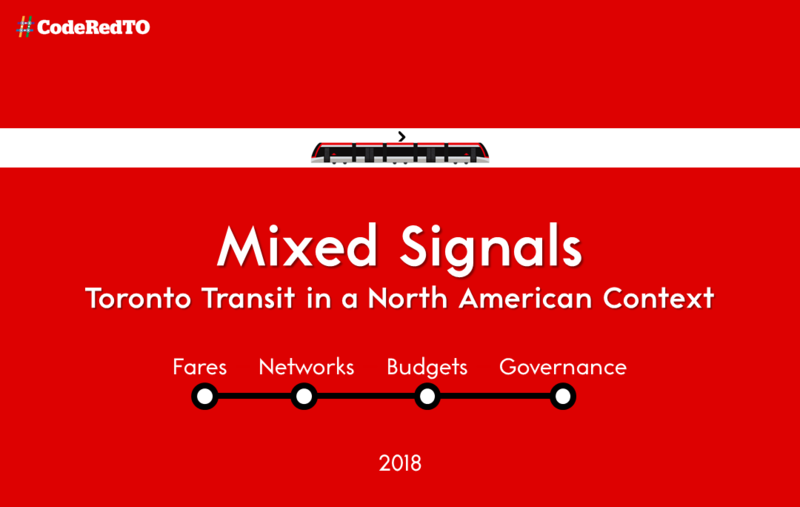 Mixed Signals: Toronto Transit in a North American Context (PDF), a report which contrasts Toronto’s fares, network design, operating budget, and governance structure with seven other peer cities across North America. In this report, we find Toronto’s strong transit ridership and reputation were achieved despite the lowest subsidy rate of any North American city, no dedicated revenue sources, overly politicized administrative structures, and a bias toward suburban tunneled extensions over core network complexity. CodeRedTO releases this report after the campaign period to allow both the public and legislators to review meaningful comparator city data at this critical moment, when proposals are circulating from governments and civil society about how to address structural issues affecting transit in the GTHA. Eighteen months in the making, this report brings together research, design, and subject matter expertise from outside transit agency and political party structures, allowing data to be used to inform policy discussions for all. This report is released under a Creative Commons license, allowing free access to use and adapt its contents in any way, as long as any derivative work is similarly released. This will increase the ability of all transit advocacy groups and interested parties without favour. The report can be downloaded at www.CodeRedTO.com. 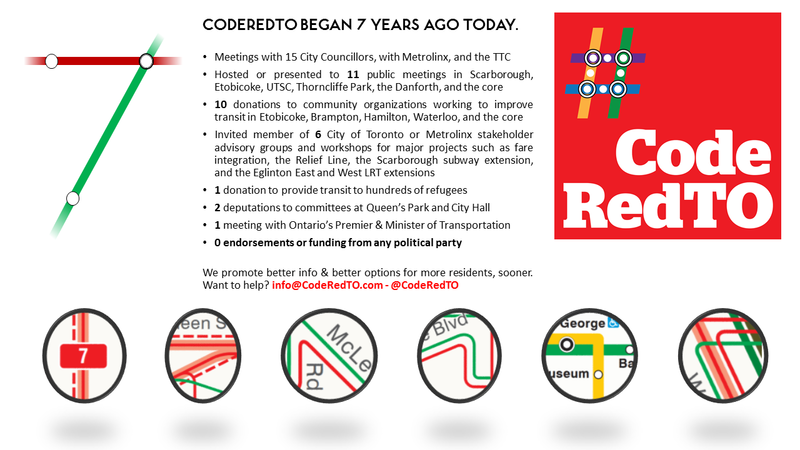 CodeRedTO was founded in 2011 as a consciously non-partisan, non-profit, volunteer-run advocate for local and regional public transit. We promote more and better transit options for more residents; using all available technologies where appropriate; creating better information for better decision-making; completion of efficient and approved plans; and increased, predictable funding for public transit expansion and operation. CodeRedTO is funded through personal donations and grants from non-profits, and directed by an advisory board with no financial interest in any transportation projects or agencies. Learn more at www.CodeRedTO.com and follow us @CodeRedTO.